Carr Valley’s Gran Canaria is a delightful hard cheese made from cow, sheep, and goat milk, with a rind that is periodically rubbed with olive oil. Aged a minimum of two years, this cheese is intensely sharp, like Parmigiano, yet buttery and a little sweet, too, with hints of honey and fruit. Carr Valley Gran Canaria, $16 a pound at CarrValleyCheese.com . Faarko, a creation of Cedar Grove Cheese in Wisconsin, is a mild semisoft mixed milk cheese (får is Danish for sheep and ko means cow) that gets richer with every bite, developing a nice complex flavor. This is a great cheese for snacking or cooking. (Grilled cheese sandwich, anyone?) Faarko, $10.99 a pound. To order, visit CedarGroveCheese.com or call 800-200-6020. Bayley Hazen Blue is a lovely cow’s milk blue cheese from Vermont’s Jasper Hill Farm. We like its firm, crumbly texture, which turns slightly creamier in the mouth. It delivers the pungent sharpness you’d expect from a blue, balanced by a subtle floral note and hints of nuts. Jasper Hill Farm Bayley Hazen Blue, $18.99 a pound at MurraysCheese.com . For information, visit JasperHillFarm.com . Another great one from Jasper Hill Farm, Constant Bliss is a buttery, bloomy-rind raw cow’s milk cheese with a dense, tangy heart that becomes soft and nutty closer to the rind. It has an intense flavor that continues to develop in the mouth, leaving you with a pleasantly pungent back-of-the-throat kick. Jasper Hill Farm Constant Bliss, $8.99 each (about a quarter pound) at MurraysCheese.com. 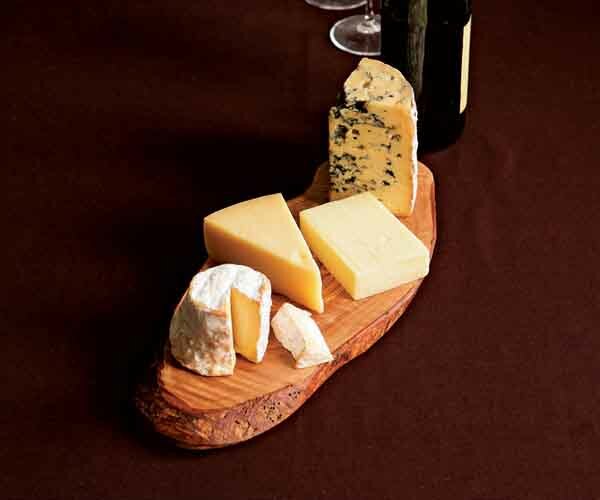 This natural olivewood board is a striking surface for setting out these special cheeses. Handcrafted in Italy, each board has a different shape and its own personality. Olivewood cheese board, $60 at ArtisanalCheese.com.